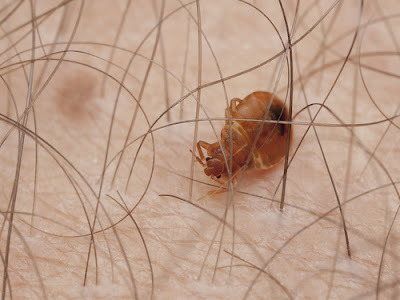 · Bedbugs mostly feed on humans(most preferred hosts) when they are asleep because of their norctunal nature. · Allergic reactions range from one individual to another with some being mild and other they develop to become severe. All this reactions depend on a person`s individual immune system when exposed to the bugs bites. Bedbug bites cause various harm to the body. The bites make the skin makes the skin itchy developing red bumps or blisters. Exposed parts of the body are the ones vulnerable to this bites.They include the face, neck, legs and arms. In severe infestations this red bumps appear all over the body. · Those that have been bitten often often show discomfort and are seen to scratch on the itchy spots and peel off skin. The exposed ares after skin is peeled of may become infected. When this wounds heal they leave a scarring or an increased pigmentation of skin which appear as black spots on the skin. · Timely treatment of these bites and trying to avoid scratching of the skin will significantly assist in avoiding the undesirable skin pigmentations and scars. Treatment of this skin pigmentation can be done using various forms of sunscreen and lightening creams that are available for use in various medical outlets in Singapore. · Apart from the bites, you can easily tell that you have a bedbug infestation in your room,home or within a hotel. A good sign that is easy to notice is the blood stains on your bedsheets or small dark spots on the beddings. It is possible to spot one or two live insects crawling on your beddings or even the shedded skins of the bedbugs. You can also notice existence of dark black stains on the mattresses and this is bedbug excreta. · These itching effects of bedbugs on the humanbody by bedbugs can easily be controlled by deploying control measures that will help minimise their spread. In Singapore several methods and techniques are being used to control these rather disburbing bugs. Many different pest control experts have come up with these different techniques and methods. Some people think that replacement of the infested mattresses from bedrooms and hotels help in controlling these bugs of which is not necessary. To avoid infestation to your mattresses there is a special product that is able to completely seal your mattresses prevent an attack from this insects. · Long term treatment of bedbugs has been seen as a problem over the years and success of long term treatment cannot be guaranteed by most pest control companies. The longterm treatment is not possible as bedbugs can be re introduced into the homes or even hotel environment. They is no agreed upon technique has been considered to be the most effective making people to look on the internet the best way available. Control of bedbugs can be at a personal level or you can hire pest control company to help control the bedbugs. When treating of bedbugs most people tend to concentrate on the personal belongings like mattresses and they forget that can thrive too in walls,wooden chairs,curtains and even electrical outlets. · The fact that Singapore is a developed country with a large population within the middleclass level makes pest control a big issue among its residents. Bedbug infestation has has grown to be a reason for discomfort and suffering for the people of Singapore as a whole. · There are many ways that pest control measure are adapted in bedrooms and many hotels over the years. Companies have deployed the use of chemicals for treatment of bedbugs. Fumigation is one of the methods that is widley used in Singapore.it basically involves use of a gaseous pesticide that is filled within the infected areas. · These pesticides are mostly harmful when they are not handled properly and can cause harm to human health. Powders is also another form of pestcides that have gotten a wide usage in control of bedbugs. They can be used as a preventive measure to inhibit the movement of bedbugs from one area to another a good example is movement of bedbugs from one ares to your bed. The effective of usage of powder is in areas that is hard to reach for example the cracks and crevices. Powder pesticides are usually very harmless to people and even pets.When applied, the powders attach to the skin scratching it and thereby causing dehydration to the bedbugs. · With the rise of infestation of bedbugs in Singapore its is easier to be affected by these bugs as we go about our normal activities.